Do these in-line mic preamplifiers mean you can use a passive ribbon mic with any preamp? 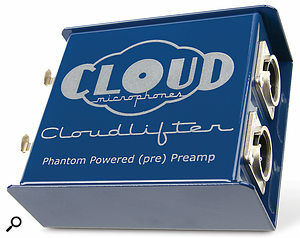 Cloud Microphones' Cloudlifters are essentially no-frills, no controls, low-noise mic preamps that use circuitry developed for Cloud's own active ribbon mics. The CL2 (pictured) is the two-channel version, and the cheaper CL1 is identical except that it has only one channel. They're designed to be used in line with low-output dynamic mics and, more specifically, with passive ribbon mics. Looking more like DI boxes than preamps, the solidly built Cloudlifters have balanced XLR connectors for input and output and that's it. There are no lights and no buttons. Each is just a steel box with two connectors per channel, and rubber feet on the base, where a folded metal plate provides a slot through which something like a velcro strap could be fitted to secure the unit to a microphone stand. The Cloudlifters take their power from a standard phantom-powered mic input, but don't pass this on to the mic input, so there's no risk of 'electrocuting' a vintage ribbon mic. The amount of gain provided varies depending on the output impedance of the microphone feeding it. Typically, it's 20-25 dB. This allows the mic preamp to which the Cloudlifter is connected to be run at a much lower gain setting — and where that mic preamp is part of a USB or Firewire audio interface, running it at a lower gain can make the difference between an electrically quiet recording and one blighted by digital noise and buzz, which, in my experience, is often a problem when running an interface preamp at close to maximum gain. The input impedance (around 3kΩ) is optimised for ribbon mics, and the signal path is entirely DC coupled, eliminating distortions that could otherwise be caused by sub-optimal coupling capacitors. My first test was to record room ambience using a passive ribbon mic, with the preamp gain on my M-Audio audio interface set to maximum. I repeated the recording via the Cloudlifter, with the interface's mic-amp gain turned down to register the same sensitivity, as calibrated against a test tone. Each recording was done with the mic about four metres from my computer and with no other room noise other than ambient sounds. The two recordings were then boosted by the same amount of gain, to make it easier to compare the results. (The resulting audio files are on the SOS web site at /sos/nov11/articles/cloudliftermedia.htm, so you can hear the differences for yourself.) Playing back the no-Cloudlifter version showed the room ambience to be largely obscured by loud digital buzz and hash, which was due largely to the internal grounding of the Firewire connection between the interface and the computer. By contrast, the Cloudlifter version was accompanied only by a gentle hiss, over which the computer fan and other ambient sounds were easily audible. I repeated the test, this time miking an unamplified electric guitar just to pick up the string noise, as I thought that would be quite challenging for a ribbon mic. Once again, with no Cloudlifter I had to use the maximum preamp gain on the audio interface to get the signal to peak at -18dB, and the level of digital crackle and buzz on the recording was really noticeable. Fitting the Cloudlifter and then adjusting the mic amp gain to give the same -18dB peak reading produced a much cleaner result, with room ambience and sounds from elsewhere in the house not being masked by the buzz. I boosted both takes by 10dB again to make comparison easier. Overall, the Cloudlifter behaved in every respect like a very well-specified, clean-sounding preamp — albeit one with no controls. For the best results, I'd advise connecting the Cloudlifter to your mic via a short, good-quality XLR cable. This will feed a higher signal into the longer XLR running to your main mic amp, which means that you're less likely to suffer from noise problems in the event that the longer cable develops a fault. In short, then, if you use passive ribbon mics, or even moving-coil dynamic models, to capture acoustic instruments at the quieter end of the scale, the Cloudlifters can help you produce much cleaner-sounding results without paying out for a high-end dedicated ribbon preamp. I really must get one! Clean gain for any type of dynamic mic. Blocks out potentially damaging phantom power. Difficult to live without once you've tried it! Using the Cloudlifter is as simple as plugging it in, yet it delivers over 20dB of clean gain to get the best from low-sensitivity dynamic mics, especially passive ribbon models. CL1 £156; CL2 £288. Prices include VAT. Unity Audio +44 (0) 1440 785843. Cloud Microphones +1 973 728 2425.